"When fragile, sixteen-year-old Hope Walton loses her mom to an earthquake overseas, her secluded world crumbles. Agreeing to spend the summer in Scotland, Hope discovers that her mother was more than a brilliant academic, but also a member of a secret society of time travelers. Trapped in the twelfth century in the age of Eleanor of Aquitaine, Hope has seventy-two hours to rescue her mother and get back to their own time. 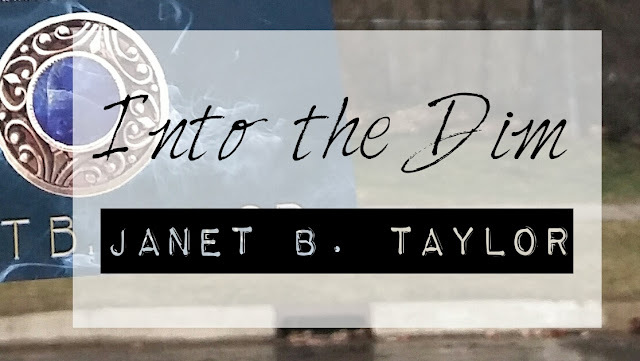 Along the way, her path collides with that of a mysterious boy who could be vital to her mission . . . or the key to Hope’s undoing." 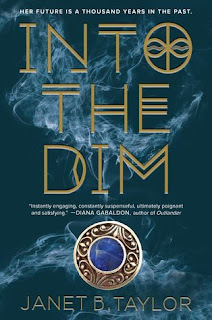 As soon as I saw that Into the Dim was described as 'a YA Outlander' I knew I needed it in my life. 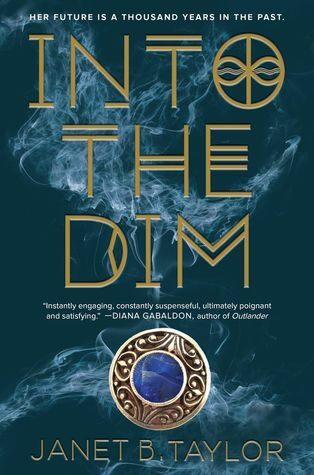 Plus, the book is Diana Gabaldon approved so (um, YES.)... and can I just say that, though I trust Diana's opinion, I have to disagree with "'... ultimately poignant and satisfying.'" I need book two ASAP. "Everyone in town knew the coffin was empty." If that's not a winning first line I don't know what is. But despite the killer first line the book has a slightly slower start. No, it definitely wasn't an 'I'm bored out of my mind' slow start. It was more of a 'there's not much action' kind of slow. And there really isn't much action or any one scene that truly reflects the depth of the characters, at least in the first chunk of the book. The first 40% of the book mainly focuses on Hope, our main character, and how she's adjusting to the unimaginable. Which was completely fine. It worked for the story and it was definitely enjoyable. However, Once the story picks up, it really picks up. There's romance, courtly intrigue, action, and multiple antagonists you immediately want to wish out of existence. (Maybe that's just me?) I became invested in the story and the characters' well being. I think one of my personal favorite characters in the book was Eleanor of Aquitaine. She wasn't someone who was always present in the storyline but she was such a huge part of the overall story. She was standing up for women's rights in a time when many men were, to put it nicely, creepy. She knew what she wanted, which is a quality I think everyone can appreciate. Collum, another main character, was not my favorite person ever. He was obnoxiously slightly brooding. There were some parts where I would even go so far as to say he was a manipulative jerk. Phoebe, who's Collums sister, was the exact opposite. I adored Phoebe! She was fun, loud, sassy, and badass. Basically, can she be my best friend?! .... and then there's Cameron. Bran Cameron. I never knew where I stood with him. One minute I would be shipping him with Hope and the next minute I would be yelling at the book because "WHAT ARE YOU DOING BRAN"
Into the Dim was a roller coaster of emotions, basically. I would recommend this book to people who enjoy books with historical aspects OR to people who like stories about time travel. "A drop of patience can yield an ocean of reward."